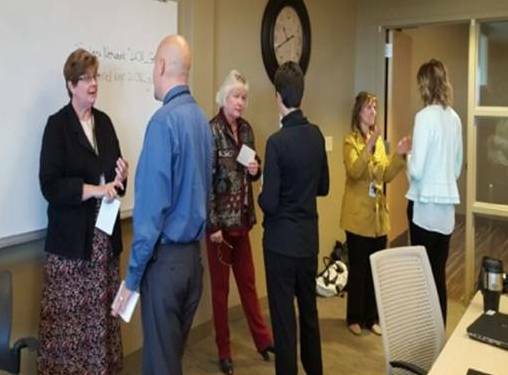 I was recently requested to facilitate a meeting of coaches and principals from K-12 buildings for the Bismarck Public Schools in North Dakota. Those of you who follow me on Twittter (@stevebarkley) know that I have been working with the district for the last four years. The agenda I was given had the coach/principal pairs explore their comfort with delivering “whys” for the district’s current initiatives and examining to what extent light or heavy coaching was taking place in their buildings. 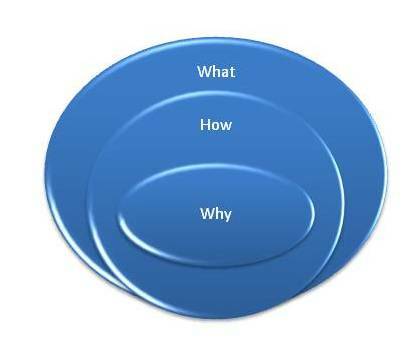 Sinek identifies that most leaders of organizations deliver messages that describe “what” they do and often how they do it but seldom get to why they do it. He compares these common leaders to great leaders who always begin by describing why the organization does what it does and then informs how and what. The message of great leaders is clearly different. The Bismarck district has a set of connected focus areas that drive the system’s agenda. It’s important that leaders can clearly communicate the “whys” for these initiatives (Professional Learning Communities, Standards Based Education, Concept and Skill Mapping, Multi-Tiered Student Support, Data Driven Decision Making, Project Based Learning.) 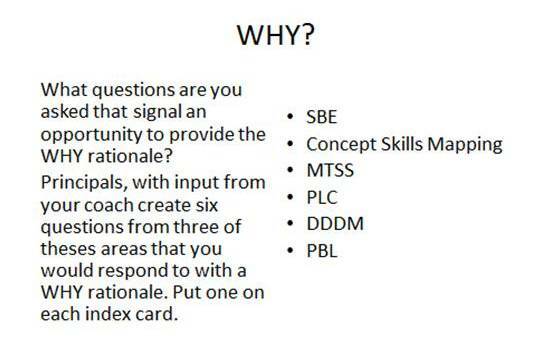 I created an activity that provided an opportunity to practice delivering “whys” for these initiatives and to receive feedback. We first had coach and principal pairs identify questions that they would likely be asked which provide an opportunity to share the “why” behind the initiatives. 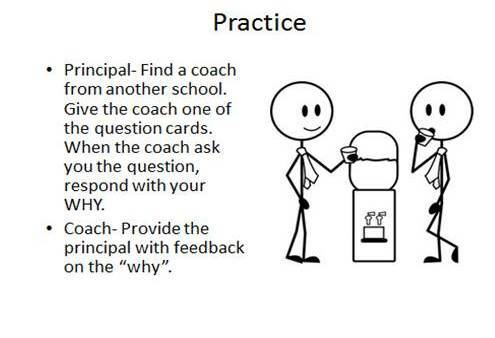 Then with the coaches lining the perimeter of the room, principals walked to a coach from another building and handed the coach an index card with one of the questions. The coach read the question, the principal practiced a response, and then the coach provided feedback and suggestions. Principals repeatedly moved to different coaches and practiced responding to the predicted questions. After several rounds principals returned to work with their coaching partner. Using the feedback the principals received and the experiences the coaches gained from other principals, the pairs worked to refine their messages. 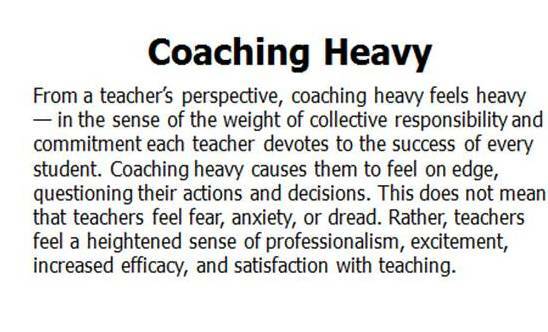 We explored this topic through the work of Joellen Killon (Are you Coaching Heavy or Light, Teachers Teaching Teachers NSDC Vol 3 May 2008) and Reprising Coaching Heavy and Coaching Light. 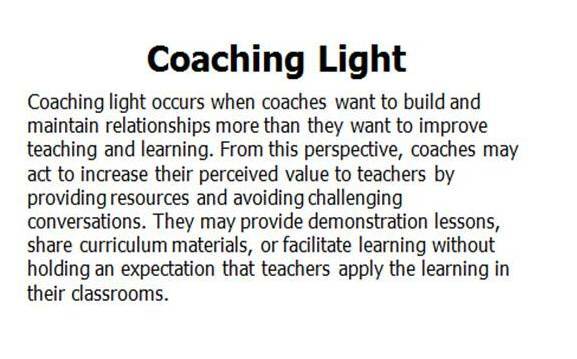 Using a checklist of heavy and light examples, the partners assessed current coaching practices. 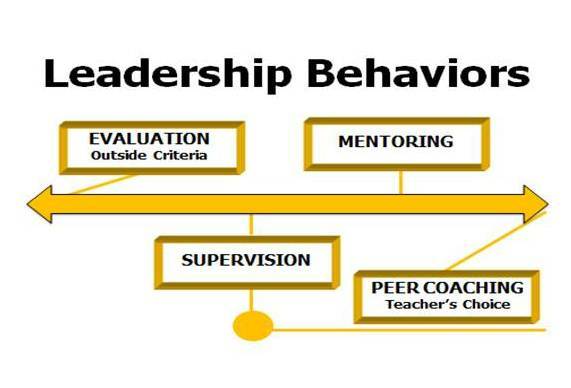 Lastly, the partners assessed the changes that were needed in teacher practices and the roles principal and coach would play in initiating and supporting those changes. Using this process for 90 minutes produced substantial dialogue with many partnership groups deciding upon some next step leadership actions to take. It was time well spent to create the questions and be able to practice our response. We know the why, but without practicing our response, we may lack confidence in our ability to respond clearly to questions. 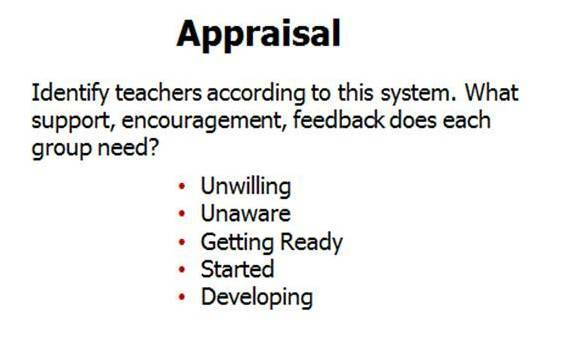 It was powerful as a coach to hear other principals respond to the questions and be allowed to give feedback/affirmation. Thank you Steve. Thank you for your guidance in this activity. We need to continue to be pushed to get into heavy coaching. This was great because we practiced having our conversations on the “Why’s” within our district. We both felt better prepared to have this discussion with staff. We are excited to inrotduce the Collaboration Coching team from SMES. Together we represent Kindergarten with Susan Rabe and Bonnie Barrett, Summer Streeter is a mulit-age First/Second Grade Teacher, Denise Cook represents Second Grade, Laurie Gateb and Julie Pauken represent Third Grade, Brian Lockwood for Fifth Grade, Jayne Ewell from TITLE I and our Common Core Coach Robyn Gonzales. The team will continue to build unity within our school and throughout our grade level teams; as well as across to other grade level teams at Superstition Mountain and collaborating with teachers throughout the district.Some of the questions that we have are how to strengthen ourselves as Collaborative Coaches to inspire others so that collaboration is encouraged and becomes the school culture/norm? What kind of skills with technology do teachers need to have in place to bring their students into the 21st Century? Is collaboration coaching meant to strengthen the teachers or the students?We are looking forward to an exciting year . One of the big keys to building collaboration is to start with team goals. 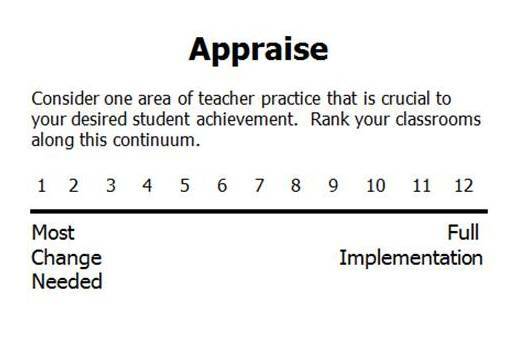 Groups of teachers set goals for specific groups of students, develop a plan to generate that learning, assess and adjust as they progress and celebrate successes. Peer observation of implementation of team plans can increase the collaborative environment.